Local election 2018: Who are Groep De Mos, the surprise winners in The Hague? Former PVV MP Richard de Mos sprung an upset in The Hague’s municipal elections by leading his independent party to victory in what was expected to be a close four-way contest. De Mos’s group won nine of the 45 council seats with 16.8% of the vote, with the VVD claiming seven seats in second place on 13.8%. D66, which won the election last time, was reduced from eight seats to six. The 41-year-old De Mos quit the PVV in 2012 after being deselected by Geert Wilders for that year’s parliamentary elections, having been elected as an MP on the party’s list two years earlier. He described the decision as a ‘hammer blow’, but started his own party to contest The Hague’s council elections in 2014, as a direct rival to Wilders. The three seats won by Groep De Mos allowed D66 to edge out the PVV for top spot and deprive Wilders of the chance to form a coalition in the Netherlands’ third city. It is likely that his party picked up votes this year from the PVV, which won just two seats after four years riven by internal conflict and the loss of a councillor who quit in protest at Wilders’s ‘fewer Moroccans’ comments. Though De Mos bills his policies as apolitical, they have a populist right-wing flavour, albeit of a more moderate variety than the PVV or Leefbaar Rotterdam. His party favours deregulation for small businesses, transport policies that encourage car use (De Mos wants to halt the extension of The Hague’s paid parking zones) and referendums for major decisions. The party has a welfare-to-work agenda and says benefit claimants should be required to do voluntary work if they are capable. ‘The state welfare system is a safety net, not a hammock,’ he has said. A former teacher, De Mos wants to introduce stricter discipline in schools, with smartphones banned from classrooms and children required to address teachers with the formal ‘u’ form. 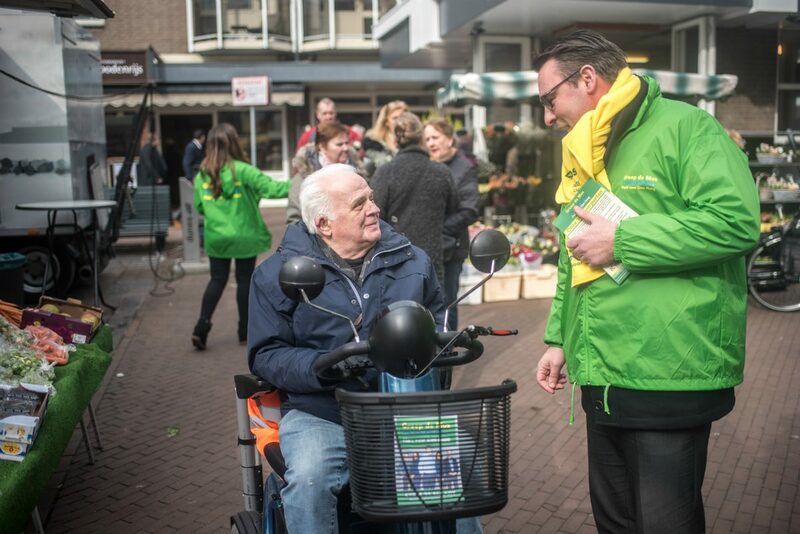 Until recently De Mos’s party was also known as the ‘Older People’s Party of the Hague. It has pledged to introduce free public transport for over-65s and tackle poverty among the elderly so they can live at home for as long as possible. As a prospective MP De Mos was an outspoken climate change sceptic who derided supporters of renewable energy as ‘flat earth thinkers’ and ‘alarmists’. Soon after being elected he was found to have exaggerated his online CV by describing himself as a former director of the school where he previously worked. De Mos apologised for the error and corrected his details. His party now faces a challenge to build a coalition in the wake of a fragmented election result that has divided the 45 council seats between 15 parties. At least four parties will be needed in the new coalition, though this is not unprecedented – the city’s last administration had five. Likely coalition partners include the VVD’s seven councillors and the CDA, who have three. But De Mos will almost certainly have to bring in either D66 or GroenLinks to make up the majority. The city’s other local party, the more left-leaning Haagse Stadspartij, is unlikely to be considered; neither are the PVV or any of the three Islamic parties which have one seat each. Turnout in The Hague was 48.3%, below the 2014 level of 51.3%.